Evernote is one of my favorite tools and the Evernote Video Training is awesome. I use Evernote every day to keep track of items of interest. It makes it so easy to store, search, find, and print anything from a web page to a receipt. It is like a giant filing cabinet in the sky allowing access to all your information from any connected device. 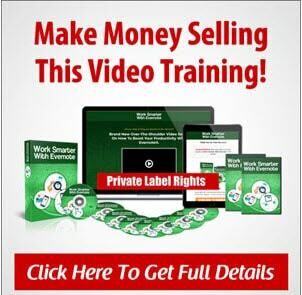 Jonathan and Charles, two internet marketers, produced some of the best training for this incredible free tool. 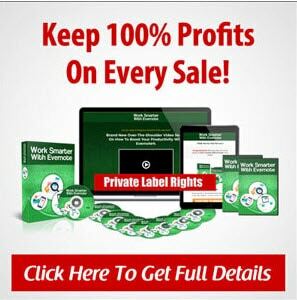 They are releasing it as a PLR product, which means you get to not only use the information to learn how best to use Evernote, but you may also resell it and keep 100% of the profits. This is really a good deal and the price will blow you away. Take a look here: Evernote Video Series. This is a brand new over-the-should 20-part video training series on how to boost your productivity with Evernote. How to get started with Evernote and discover how it will help your business and personal life. How to set it up on your PC for maximum efficiency. How to use it on your mobile phone and access it anytime and anywhere you wish. How to scan documents and share them on Evernote. How to use voice notes and dictation to increase productivity. How to take notes, organize your files and integrate them with your calendar. How to do integrations with services like WordPress, Trello, Pinterest, Twitter and Google Drive. Aside from this over-the-shoulder video series, they have also including ready-made sales materials such as sales copy, commercial video, graphics, etc. should you wish to assist others to achieve their productivity goals and make this available to them. You can get started with this brand new Evernote Video Training training that ALSO comes with PLR. Don’t miss this! Learn from it and then sell copies and keep all the profits! It comes with permission to do that. The platform is robust and people are loving Evernote’s service. They have grown exponentially over the past couple of years with an impressive figure of over 200 million registered users as at November 2017. Over 5 Billion ‘notes’ were created on Evernote by these users since it’s launch in 2007. Have an awesome idea? Add it on Evernote. You can refer back to it anytime when you feel like.Then when you’re ready to make your ideas a reality, Evernote will be there to bring all the pieces together for you, at your convenience. It’s An amazing platform that can help you in your business and your personal life. Declutter your life and don’t be stressed about remembering every piece of information, idea, graphic, receipt, and other information you have saved. I highly recommend Evernote and this special training. I have used Evernote for years and I sure wish I had this step-by-step training when I started. It would have same me a lot of time and opened new doors to getting organized that I had to discover the hard way. I LOVE Evernote and I know you will too.